We do not live near either of our daughters grandparents. We skype with each set about two times a week. Recently they have been trying to do things to get her attention. 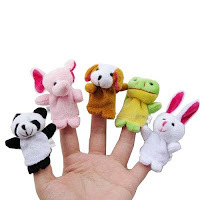 These finger puppets are only $2.88 and you can get free shipping with amazon prime. Our little girl loves to watch them and play with the little puppets when she visits her grandparents.